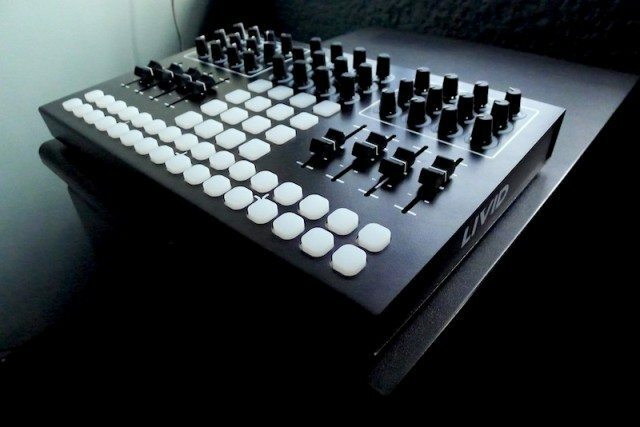 The result of a unique collaboration between Livid Instruments and Richie Hawtin, the brand new Livid CNTRL_R is a fully mappable, open-source boutique MIDI controller. 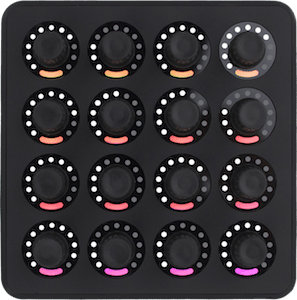 With a slew of programmable knobs, endless rotary encoders, faders, and buttons, there’s certainly a ton of tangibles to keep controllerists busy, whether you’re a DJ playing cuts from Traktor or remixing and creating tracks on the fly with Livid’s step-sequencer apps for Ableton Live! Read on for our review of the unit. The Good: Lots of controls and deep step-sequencer integration with Ableton Live in a small footprint. High quality aluminum construction feels rock-solid, yet light and small enough to fit in your backpack for a gig. 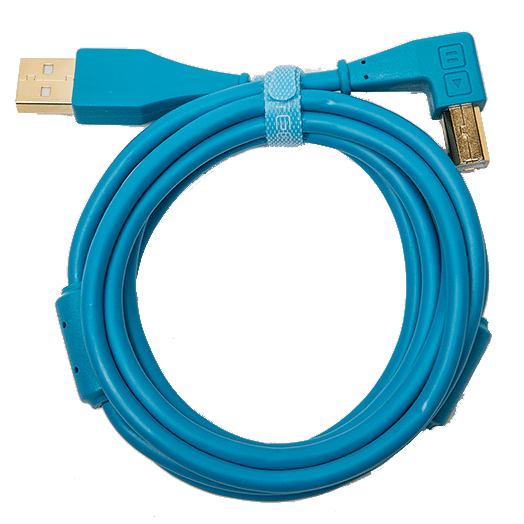 Can be used with just about anything that supports MIDI. Expandable with Livid’s line of XPC controllers. Pretty multi-color LEDs make girls at the bar think it’s cute. The Bad: Ableton Live remote script can be confusing at first, since you’re launching clips on a 4×4 (albeit scalable) grid. Not as flexible as the Livid OHM in terms of larger button layout and cross-fader features. Expensive, given that it doesn’t come with its own soundcard/interface. Buttons aren’t stiff, so not as ideal for finger drumming ala MPC/Maschine (they’re not drumpads). 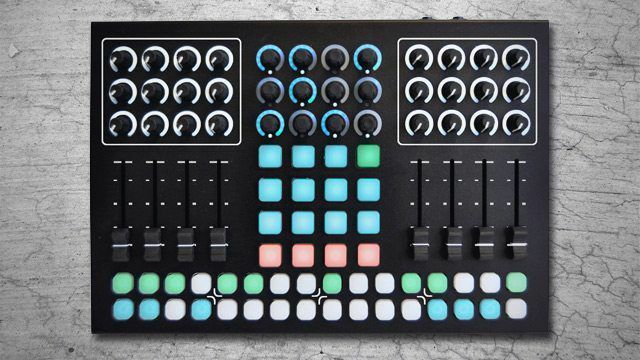 The Bottom Line: For the price of around 2 1/2 APC 40’s, you get this suite of fully programmable controls: 8 faders, 48 multi-color LED buttons, 24 knobs, and 12 pushbutton encoders with LED ring indicators. 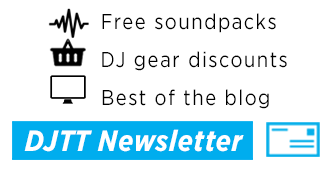 For Ableton Live users, you’ll undoubtedly want to get it for the step-sequencer devices that Livid and Richie Hawtin developed, not to mention the deepening well of Max for Live devices and Remote Scripts created by its online community. This unit does not have a built-in sound card, so you’re going to have to pair it up with one still. Building on Livid’s reputation for quality, the CNTRL_R presents itself as the modern controllerist’s rugged toolbox: an all black, aluminum casing that exudes minimalist cool coupled with an intuitive layout made of quality tactile material. There are two sets of 4 faders and 12 knobs on either side of the unit bridged together by a 4×4 matrix of buttons and 12 rotary push-button encoders. The rubber on all the knobs and encoders make for satisfyingly accurate tweaks, while the buttons have a slightly-matte finish that feel like they tug lightly at your fingers as you gently glide over them. Livid asked us to note that these are not drumpad buttons – and if you’re looking to make use of the buttons for finger drumming like you would do on an MPC, you’d be quite disappointed as the buttons are a bit squishy (like in those old Denon CD Players). 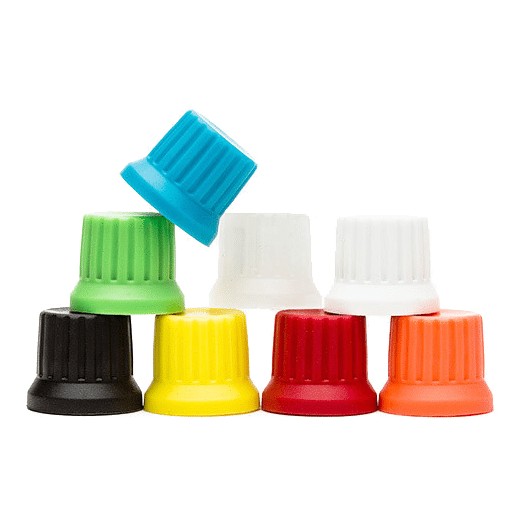 Each 60mm fader has a delightful resistance that feels just right, provided you aren’t using it for scratching or turntablism. Every tactile detail screams quality, and just spending a minute twiddling around with the controls brings comfort to the fact that you just spent quite a bit of cash on a piece of kit. 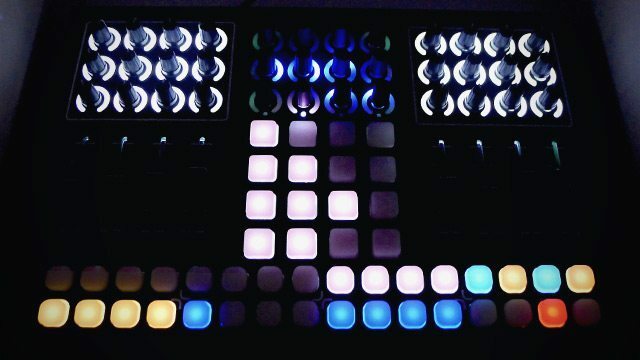 The two rows of 16 buttons at the bottom of the unit are what set this controller apart from the rest of the pack: when used in conjunction with the free DrumStepp:R and SynthStepp:R devices in Ableton Live, the unit transforms into a step sequencer that is a joy to use onstage and in the studio. The multi-color LED’s ensure that you get enough visual feedback and information on the CNTRL_R without having to squint at your laptop. The CNTRL_R houses MIDI connectivity and a USB port at the back for maximum compatibility with your existing setup. There are also a pair of jacks for MIDI devices, as well as Livid’s proprietary expansion port for their XPC line of products should you wish to expand your palette of controls. As previously mentioned, Livid maintains an expanding repository of mappings for all of its controllers: Already on the site are Remote Scripts for Ableton Live (including the DrumStepp:R and SynthStepp:R apps), as well as a mapping for Traktor 2 that allows control of up to 4 decks (2 main, 2 sample). 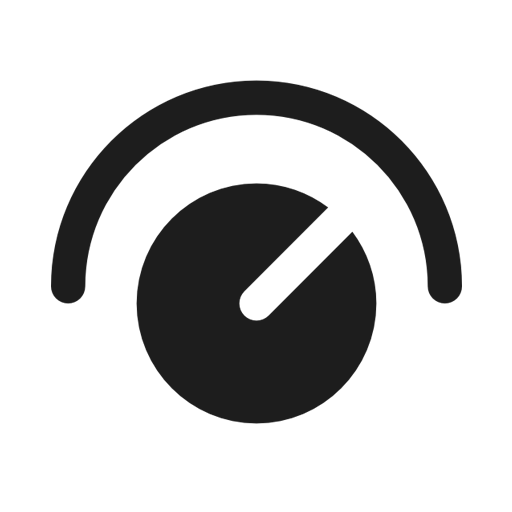 Needless to say, this is a great alternative for EDM DJ’s that require 4-channel operation of Traktor and want everything in front of them in a simple fashion. The Livid community has also come up with a handful of apps for VJ’s and Lighting, but currently doesn’t support CNTRL_R out of the box as of this writing, so if you’re planning to use it for those purposes you’re in for a bit of mapping! Of course the best part about the CNTRL_R is that it’s entirely reprogrammable: using the free CNTRL_R editor program lets you reassign any function of your software to the controller, allowing you to customize it depending on what app you’re using. It stores up to four banks of mappings in its flash memory, so you could use one CNTRL_R to practically control and switch among all your devices, apps and plugins within your DAW! A shot of the CNTRL_R in the dark - backlit faders and indicators on knobs would be handy! You obviously can’t have it all when it comes to a fully customizable, hardware MIDI controller (unless we’re talking about a touchscreen tabletop), but what I really wanted to see in the CNTRL_R was what they intentionally left out: a crossfader. 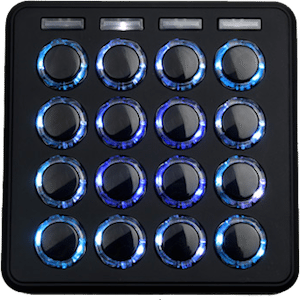 I know Livid is marketing this as a step sequencer and not a successor to their OHM RGB, but after trying out their Traktor mapping at a gig, I wasn’t too sure about using an endless rotary encoder to switch between two decks, but that’s just me. The expansion port for their XPC devices is a welcome addition if you’re looking for extra controls, however a crossfader isn’t in any of their add-ons. On the software side, I would’ve loved the SynthStepp:R and DrumStepp:R to have a sequence function within its internal pattern storage, just like Ableton’s “Follow Action” feature so you could leave it running without having to switch between patterns manually. THE NEXT STEP IN LIVE PERFORMANCE CONTROL? In essence, the CNTRL_R is yet another customizable MIDI device, and there already are many to choose from! 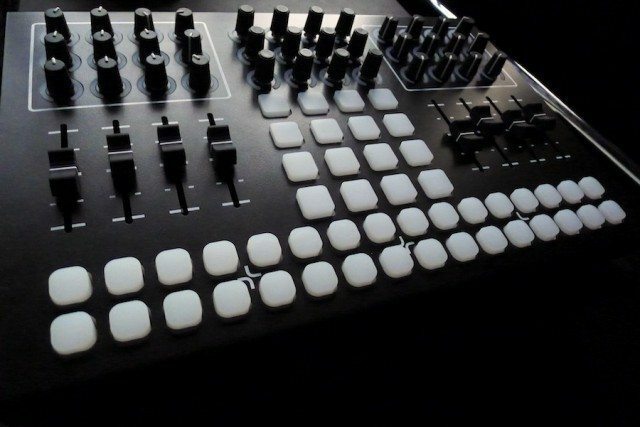 With all the controllers crowding the marketplace, it’s easy to pass on the CNTRL_R if you already own a grid-based controller like the Launchpad or a 4-channel all-in-one like the Traktor S4. However, Livid is able to position itself as a provider of a very specific electronic musician’s niche by making its step sequencer feature layout the highlight of what to some might seem an otherwise “redundant” piece of gear. Granted, there are other step sequencers out there (you can even turn the Maschine into one with its Step mode), but there’s something quite special about having it all laid out for you right before your very eyes while you consider every fraction of a second’s musical possibilities. In case you missed it, check out Mad Zach’s review of Livid’s other new controller, the Ohm RGB Slim!